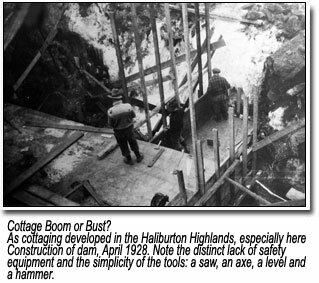 Many of the earliest dams in the Haliburton Highlands were built by lumber companies in order to prolong the spring runoff and move logs more easily to their sawmills. In 1905 and 1906 a series of Orders in Council gave the Federal Government the authority to build new dams and reconstruct many others. These dams retained spring runoff in the lakes in order to maintain water levels suitable for both navigation and the generation of electricity from Haliburton all the way to the Trent-Severn Waterway system. At that time, the cottage boom hadn’t begun, and the Hawk Lakes were home to only a handful of hunt camps. Most of the dam construction and repair work was done in the late 1920s. 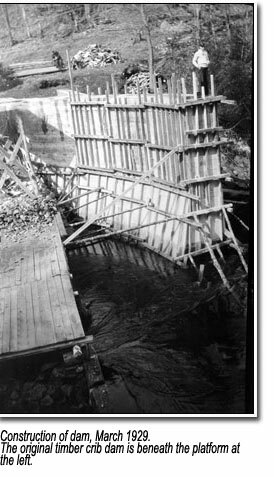 This concrete dam replaced a timber crib and rock dam during the winter of 1928-29, as shown in these two photos. As a result of the new and reconstructed dam system, summer water quality improved and spring flooding was reduced. Water was drawn throughout the navigation season, beginning in the uppermost lakes and working down through the storage lakes as more water was needed later in the summer. As cottaging developed in the Haliburton Highlands, especially here at the Hawk Lakes, so too did the conflict between the government and the cottagers. The government had the right to draw down water for navigation and power generation, but some years the Hawk Lakes lost up to 12 feet of water, leaving cottagers stranded, docks inaccessible, and boats sitting in mud. During the 1950s and 1960s, extensive correspondence took place among government agencies and cottage associations of both Hawk Lake and Halls Lake. The winch system at this dam was occasionally vandalized and stop logs were damaged by unknown parties seeking to stop the draw down of water. After many years of debate, a different procedure for drawing water has evolved. Water is drawn from each of the lakes on a equal percentage basis according to the storage range established for that lake. Several times a week, Trent-Severn Waterway staff read water levels at dams and make the necessary log changes ensuring that drawdowns are proportionate. Construction of dam, April 1928. Note the distinct lack of safety equipment and the simplicity of the tools: a saw, an axe, a level and a hammer. Construction of dam, March 1929. The original timber crib dam is beneath the platform at the left.